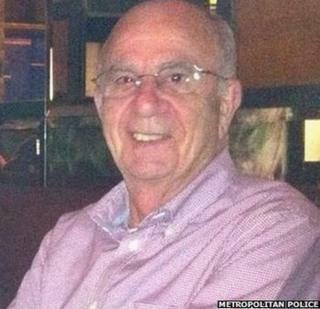 A prolific burglar has been sentenced to life imprisonment for murdering a grandfather who he stabbed to death in his west London home. Aaron De Silva, 21, stabbed Joseph Griffiths, 73, 22 times after breaking into his house in Hazlebury Road, Fulham, early on 10 November 2012. He was sentenced at the Old Bailey to serve a minimum of 32 years. De Silva had tried to plead guilty to manslaughter on the grounds of diminished responsibility. But the prosecution refused to accept the plea and he was tried for murder. Successive psychiatric reports found that while De Silva may have had a personality disorder, he was suffering no mental illness at the time of the killing. De Silva has 31 previous convictions, including robbery, assault, burglary and carrying a knife. Following sentencing, the Crown Prosecution Service's London Chief Crown Prosecutor Baljit Ubhey said: "This was an unprovoked and violent attack by Aaron De Silva on a man more than 50 years his senior who was trying to protect his home and his family. "This was a terrifying ordeal for those in the house that night. "I hope the sentence today gives some small comfort to Mr Griffiths' family and friends. Our thoughts are with them."